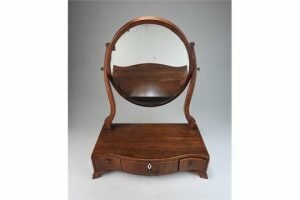 An early 19th century mahogany swivel toilet mirror, the oval mirror plate over a serpentine three drawer base raised on ogee shaped bracket feet. 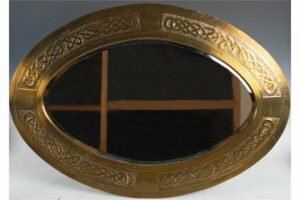 A Scottish Arts & Crafts brass wall mirror, the bevelled oval mirror plate enclosed within an embossed Celtic knot-work panel border. 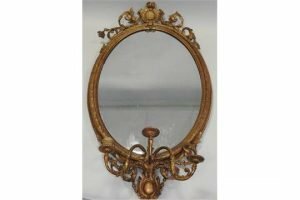 A 19th century girandole, the oval mirror plate within a moulded gesso frame with shell carved pediment, over three candle arms to the scrolling leaf apron. 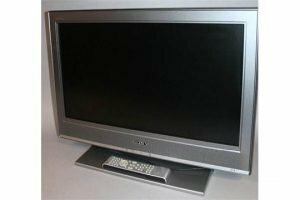 A Sony 26″ colour Television, in grey surround with accessories. 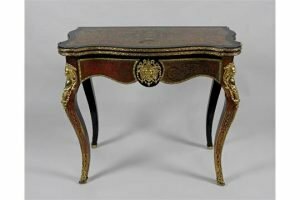 A 19th century boulle style and ebonized serpentine fold-over card table, on four cabriole legs with gilt metal mounts terminating in a gilt metal scroll foot. 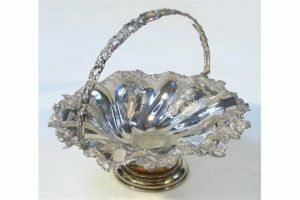 An early 20th century silver plated bon bon basket, with pierced swing handle, bright cut, etched and raised with flowers to the shaped gadrooned outline, raised with further flower heads on a bead lined foot. 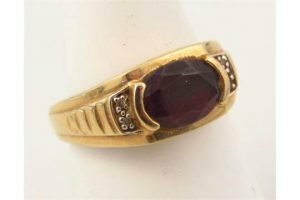 A gentleman’s dress ring, set with an oval garnet coloured stone, part textured shank. 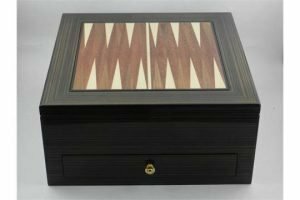 A macassar ebony games box, the reversible lid with backgammon and chess boards, the interior fitted with dice cards etc. all above a drawer fitted with contemporary chess pieces. 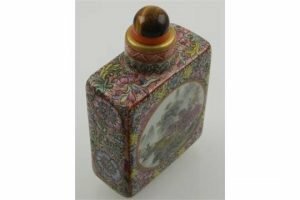 A fine Chinese square form millefleur design snuff bottle with stopper, having circular panels of various scenic landscapes, bears a horizontal six character Chein Lung mark to base. 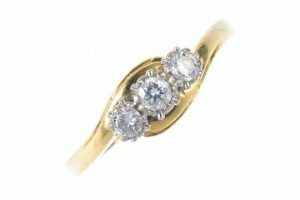 An 18ct gold diamond three-stone ring, the slightly graduated brilliant-cut diamond line to the asymmetric sides and plain band. Estimated total diamond weight 0.30ct. Hallmarks for London. 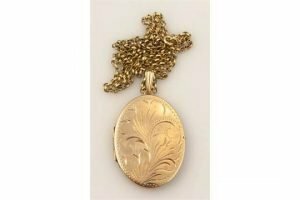 A 9ct gold pendant locket, of oval part engine turned outline, attached to a slender link chain. 12 grams. 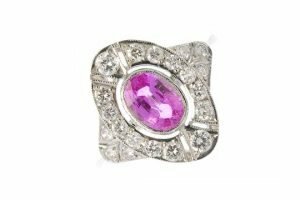 A sapphire and diamond cluster ring, the oval-shape pink sapphire collet within a graduated brilliant-cut diamond surround, to the similarly-cut diamond trefoil sides and plain band. Estimated total diamond weight 0.60ct. 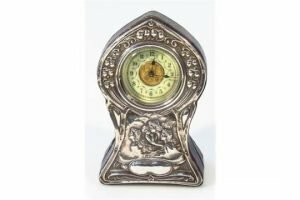 An Edwardian Art Nouveau silver mantel clock, by Ridley Brothers & Merton, the shaped onion topped case revealing an Arabic dial with repoussé decorated figure heads and flowers, with a leather back and enclosed movement, Birmingham, 1905. 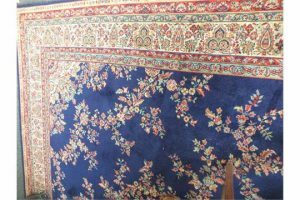 A 20th century machine woven blue ground Persian design carpet. 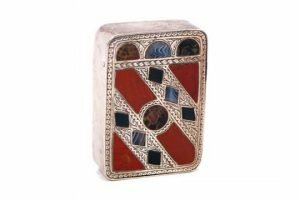 A Victorian silver vesta case of rectangular form, with hinged engraved cover set with Scottish hard stones and containing six wax vestas. Birmingham 1897. 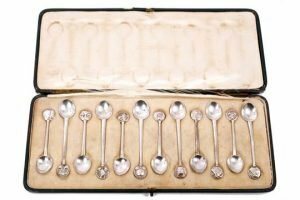 A set of twelve sterling silver coffee spoons with straight stems and signs of the zodiac terminals, in a green leather covered fitted case. A diamond and gem-set necklace designed as a square-shape emerald, sapphire and ruby swag, gathered by brilliant-cut diamond highlights, to the figaro-link back-chain. Estimated total diamond weight 0.25ct. 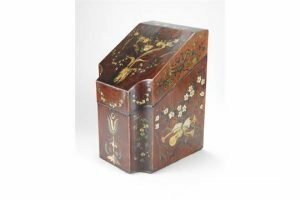 A George III mahogany knife box, later polychrome decorated, the interior later fitted with stationery dividers. 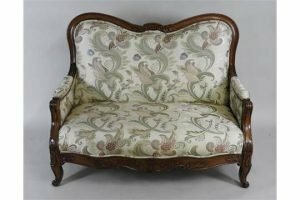 A Victorian two seater settee, the rosewood show frame with shaped top rail above re-covered padded back over stuffed seat and enclosed arms, on short cabriole front legs terminating in a scroll foot and united by a leaf moulded and shaped front seat rail. 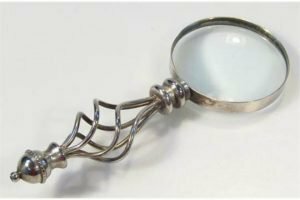 A 20th century magnifying glass with a plated twist handle, inverted orb pommel and plain circular outline.